The project was executed under a Fast Track delivery method to ensure a fully-commissioned and validated facility to meet contracted manufacturing commitments. ISO8 suite for the manufacture of medical devices. Included in this facility is a cGMP warehouse for in-process and final product storage as well as Quality control and Biology laboratories. There are also machine shops for the repair and maintenance of manufacturing equipment as well as general facility maintenance. The project was executed under a FastTrack delivery method to ensure a fully-commissioned and validated facility to meet contracted manufacturing commitments. 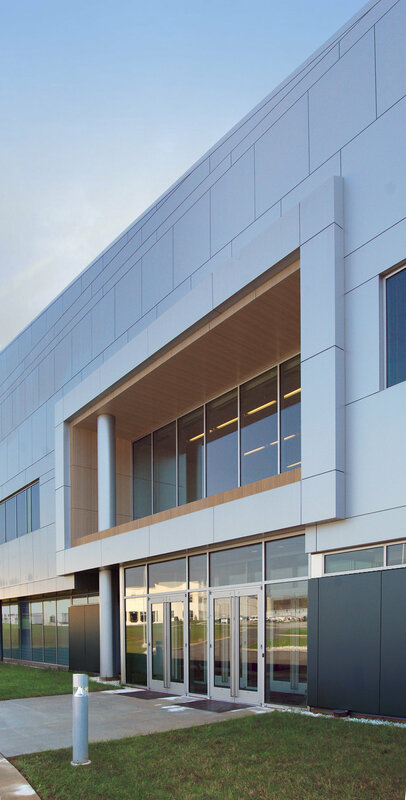 The office building exterior façade material is a composite aluminum panel system used in a rain screen construction. The cGMP facility uses pre-insulated tilt up precast concrete panels to achieve a cost savings and speed up construction.